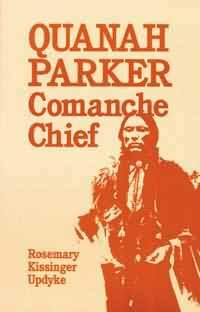 In 1845, a son was born to a white mother and a Comanche Indian father. This child, named Quanah for the flower-filled valley of his birth, was to become one of the greatest Comanche chiefs ever to have lived. As a young chief, Quanah was determined to fight the encroachment of pioneers onto Indian lands. His tribe became the most feared on the Great South Plains as they fought the invading Americans. The brave chief fought many bloody battles to keep his people free to live the life they were accustomed to before the arrival of the white man. Finally, after continued attacks by the settlers and the army, Quanah was forced to bring his people to the reservation by the severe lack of food, clothing, and housing that had been brought about by the senseless slaughter of the buffalo herds. He was the last Indian chief to surrender. On the reservation, Quanah was named chief of all Comanches, and from that day forward, true to his word, he worked for a peaceful coexistence between the red and white races. Quanah continued to lobby for Indian rights up until his death in 1911, and today is known as the last great Comanche chief. Rosemary K. Kissinger was born and raised in east Texas, where she first heard the story of the exciting exploits of the last great Comanche chief. A resident of Long Island, New York for 30 years, she now resides in the Pocono Mountains of Pennsylvania.